Elite 100% Whey Protein Blend (Whey Protein Isolate, & Whey Protein Concentrate), Whey Peptides, Polydextrose, Natural and Artificial Flavors, Cocoa (Processed With Alkali), Gum Blend (Cellulose Gum, Xanthan Gum, Carrageenan), Salt, Zytrix® Enzyme Blend (Protease, Lactase, Lipase), Acesulfame Potassium, Sucralose, Stevia Leaf Extract. Add 1 level scoop to 6-8 ounces of water, milk, or juice. Stir, shake, or blend for 20 seconds, or until completely dispersed, then drink immediately. Elite 100% Whey Protein Blend (Whey Protein Isolate, & Whey Protein Concentrate), Whey Peptides, Polydextrose, Brazilian Coffee Grounds†, Potassium Chloride, Cocoa (Processed With Alkali), Natural Flavors, Salt, Caffeine Anhydrous†, Gum Blend (Cellulose Gum, Xanthan Gum, Carrageenan), Zytrix® Enzyme Blend (Protease, Lactase, Lipase), Acesulfame Potassium, Sucralose, Stevia Leaf Extract. Formulated for easy mixing. Add one scoop (included) to 6-8 oz (180mL-240mL) of water, milk, or your favorite beverage and mix thoroughly. Enjoy prior to workouts, within 30 minutes after workouts or anytime you desire a high-quality, high-protein drink. Contains: MILK, PEANUT & SOY. Elite 100% Whey Protein Blend (Whey Protein Isolate & Whey Protein Concentrate), Whey Peptides, Polydextrose, Natural and ARtificial Flavors, Gum Blend (Cellulose Gum, Xanthan gum, Carrageenan), Zytrix Enzyme Blend (Protease), Lactase, Lipase), Acesulfame Potassium, Sucralose, Stevia Leaf Extract. Contains Milk and Soy Lecithin. Add 1 level scoop to 6-8 ounces of water, milk, or juice. Elite 100% Whey Protein Blend (Whey Protein Isolate, & Whey Protein Concentrate), Whey Peptides, Cocoa (Process With Alkali), Natural And Artificial Flavors, Potassium Chloride, Salt, Gum Blend (Cellulose Gum, , Xanthan Gum, Carrageenan), Zytrix® Enzyme Blend (Protease, Lactase, Lipase), Acesulfame Potassium, Sucralose, Polydextrose, Stevia Leaf Extract. Elite 100% Whey Protein Blend (Whey Protein Isolate &, Whey Protein Concentrate), Whey Peptides, Polydextrose, Natural And Artificial Flavors, Gum Blend (Cellulose Gum, Xanthan Gum, Carrageenan), Zytrix® Enzyme Blend (Protease, Lactase, Lipase), Sucralose, Acesulfame Potassium, Stevia Leaf Extract. Whey Protein Blend (Whey Protein Concentrate, Whey Protein Isolate, Hydrolyzed Whey Protein Concentrate), Natural and Artificial Flavor, Polydextrose, Soy Lecithin, Salt, Gum Blend (Cellulose Gum, Xanthan Gum, Carrageenan), Potassium Chloride, Acesulfame Potassium, Sucralose, Steviol Glycosides (Stevia). Formulated for easy mixing. Add one scoop (included) to 6-8 oz (180mL-240mL) of water, milk or your favorite beverage and mix thoroughly. Enjoy prior to workouts, within 30 minutes after workouts or anytime you desire a high-quality, high-protein drink. Ion-Exchange Whey Protein Isolates and Cross Flow Ultra Filtration Whey Protein Concentrate (Providing Di-Peptides, Tri-Peptides, Oligo-Peptides, and Poly-Peptides), Whey Peptides, Cocoa, Natural and Artificial Flavors, Guar Gum, Potassium Chloride, Acesulfame-Potassium, Sodium Chloride, Silicon Dioxide, Soybean Oil. Elite 100% Whey Protein Blend (Whey Protein Isolate, & Whey Protein Concentrate), Whey Peptides, Natural and Artificial Flavors, Polydextrose, Citric Acid, Beet Root Powder (for Color), Gum Blend (Cellulose Gum, Xanthan Gum, Carrageenan), Salt, Zytrix® Enzyme Blend (Protease, Lactase, Lipase), Acesulfame Potassium, Sucralose, Stevia Leaf Extract. Ion-Exchange Whey Protein Isolates and Cross Flow Ultra Filtration Whey Protein Concentrate (Providing Di-Peptides, Tri-Peptides, Oligo-Peptides, and Poly-Peptides), Whey Peptides, Cocoa, Natural and Artificial Flavors, Guar Gum, Potassium Chloride, Acesulfame-Potassium, Sodium Chloride, Soybean Oil. Ion-Exchange Whey Protein Isolates and Cross Flow Ultra Filtration Whey Protein Concentrate (Providing Di-Peptides, Tri-Peptides, Oligo-Peptides, and Poly-Peptides), Whey Peptides, Natural and Artificial Flavors, Guar Gum, Acesulfame-Potassium, Potassium Chloride, Soybean Oil, Silicon Dioxide. Ion exchange whey protein isolates, cross flow ultra filtration whey protein concentrate, whey peptides, natural and artificial flavors, acesulfame potassium. Contains milk and soy. Add 1 level scoop to 5-6 ounces of water, milk, or juice. Stir, shake, or blend for 20 seconds, or until compeltely dispersed, then drink immediately. Elite Whey Protein is the Muscle Fuel of Choice For Athletes Who Insist on Only the Best for Their Bodies. Made with 100% whey protein, there's zero sugar, fructose, salt, or carbohydrates added in. Just a power-packed 24 grams of protein per serving with the great taste you expect from DYMATIZE, available in 3 sizes with 3 all-natural flavors and 9 other flavors. Overall, Mike, CJ, and the team at PricePlow are huge fans of this, especially vanilla (and the above cinnamon flavor). This is a standard protein that nearly everyone will love, and is competitive with Optimum Nutrition's 100% Whey. See our new Chocolate Cake Batter Review!!! Chocolate Cake Batter is AWESOME! Everyone knows that Dymatize has a reputation for our great tasting, high quality protein. The time has finally come for Dymatize to produce a high quality whey protein for incredible value. The Elite Whey Protein Isolate is the perfect blend of whey protein concentrates, ion-exchange whey protein isolates, and whey peptides. Elite has no added sugar, fructose, salt, or carbohydrates. And Elite now contains a proprietary digestive enzyme blend including Zytrix to help amplify absorption, and to make Elite even more agreeable to lactose intolerant individuals. With protein being the cornerstone of muscle recovery and growth, what better way to save a few bucks and build your physique than with Elite Whey from Dymatize? As good as Elite tastes, you might expect it to be filled with sugar, artificial sweeteners or sodium, but no! Elite Whey contains no sugar or aspartame! Plus, Elite Whey mixes smoothly and quickly in a glass or shaker bottle so it's easy enough to use anywhere, anytime. Just add water, milk, or juice and drink! A Product You Need at A Price You Can Live With. Elite is made to work great, yet not break your bank. In fact, for each serving, Elite not only costs less than the leading brand, it also costs less than most other sources of protein you eat. 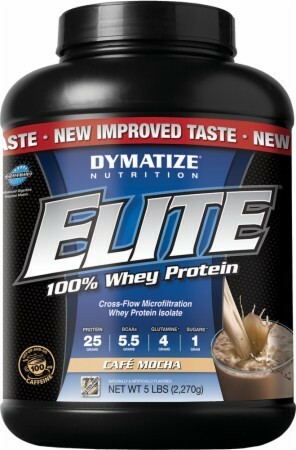 So if you are looking for inexpensive high quality protein, Dymatize Elite Whey is your perfect choice.